Your first line of defense in battle isn't typically your armour, or even a good sword parry, but instead a good shield. And at Medieval Armour, we carry a wide assortment of different shields, ranging from functional shields and battle ready shields that will deflect a blow and save your hide to decorative shields that are perfect for hanging above your mantle. A staple of the traditional warrior for hundreds of years, medieval shields were often just as much protection as they were symbolic of their warrior. We offer a number of shields in different materials, ranging from wood shields to steel shields, both of which serve effectively in battle and offer their own unique ups and downs. We offer shields from various time periods, ranging from traditional Greek shields to Roman shields, all the way up to medieval shields and renaissance shields, as well as an enormous number of shields used by the groups of these eras! That means that if you're looking for a Viking shield, you can find it here, just like you can find knight shields with historic heraldries and crusader shields adorned with holy crosses. 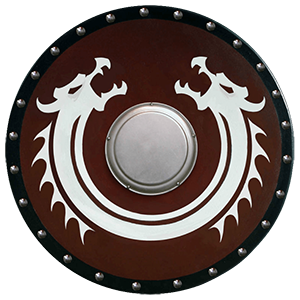 We even have fantasy shields, that are pure depictions of artistic freedom emblazoned on both functional shields and decorative shields. If you're marching into battle, you'll want an SCA shield or a battle ready shield for sure, but otherwise, these shields are all perfect for display and for carrying as a part of a costume. No warrior ever has to go without a shield, at least not when Medieval Armour is here to provide a staggering assortment of different medieval shields in dozens, if not hundreds, of different designs, all to suit a wide array of different tastes and purposes. There isn't a wall in the world that couldn't benefit from having one of Medieval Armour's decorative shields displayed on it. Each and every one of our decor shields are impressively constructed and designed with display in mind, often replicating classic medieval shield shapes emblazoned with distinctive and noteworthy heraldries as well as iconic symbols and designs. As one can imagine, these display shields come in several different styles, if only because there are so many groups and individuals throughout the medieval age that are worth acknowledging. A Richard the Lionheart shield would look great on the wall to celebrate one of England's most famous kings and one of history's well-known crusaders. A Templar shield would be the ideal accent to display for any history enthusiast who loves the crusades or the Knights Templar. A black prince shield is the perfect commemoration to a great military leader. And these are just ideas. Each one of these decorative medieval shields is a quality piece of work that features impressive detailing and breathtaking design, which all but ensures that every shield you see here is a work of art that's worth displaying as a part of almost any decor. Whether you go for a famous name like a Charlemagne shield or a Charles V shield, or just go for something that's just incredibly impressive, like a renowned Marto shield, you can bet that it will be an amazing display piece. 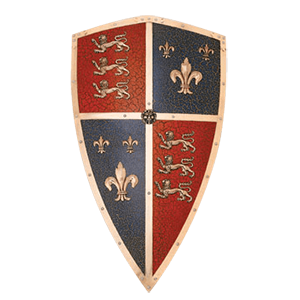 If you're planning on using your medieval or renaissance shield, then you can bet that you're going to want to get it from Medieval Armour's selection of functional shields and bucklers. These battle ready shields are ready to go, providing a secure and sturdy defense that will enable a warrior to deflect blows and defend himself (or herself) with ease. In essence, you'll find a few different eras of shields floating around here. 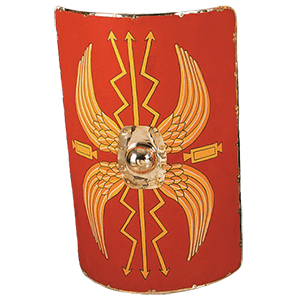 We offer a number of Greek metal shields and functional Roman shields, many of which are emblazoned with various designs and symbols that pay homage to the Greek and Roman cultures. 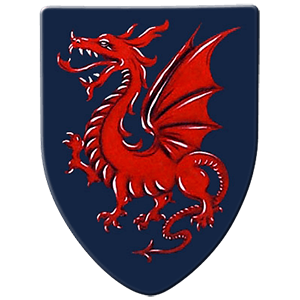 We also offer a staggering array of medieval shields, in a variety of types, ranging from the traditional knights shields like the heater shield and the kite shield, to the more common round shield, which has been in use since before the Greek era. We even offer renaissance shields and bucklers, for all those who seek a more refined and agile form of fighting! The best part about every one of these shields, from knight shield to Viking shield to buckler, is that each one is fully functional. That's right, these metal shields and wood shields are designed to take a beating and continue on, just like the shields of old! A good steel shield is a perfect re-enactment shield or SCA shield to carry into battle and protect yourself with! And even better, after you've won the day, you can hang up these functional shields for display, because nothing's better than being able to tell stories about the battles you won with your display pieces. If that sounds good to you, then take a moment to browse through Medieval Armour's functional shields. Chances are you'll find something that is sized just right and shaped to perfectly protect you, when you march into medieval combat. The Society for Creative Anachronism, also known as the SCA, a group of reenactors who attempt to recreate the arts, and skills of pre-17th century Europe. In combat, they have strict rules and regulations of what can and cannot be used. Luckily, Medieval Armour has done some of the work for you, as all of our SCA battle ready shields are up to code on most common SCA regulations. designed according to strict regulations, each of these shields is a completely, one-hundred percent battle ready shield, which means that a warrior can carry them with the intent of using them to defend against weapon strikes, just like a real medieval shield. 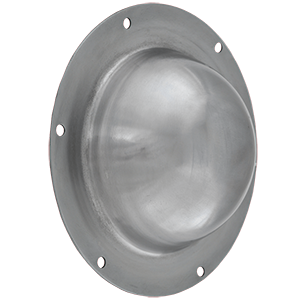 We offer both round shields and heater shields, replicating two of the more common shield types that were favored by soldiers and warriors across medieval Europe. And because they work so well, these functional, steel shields also double over as brilliant reenactment shields, where their heraldries provide a touch of realism and their strength ensures a wielder's defense. Speaking of heraldries, our battle ready shields feature a wide assortment of designs, ranging from plain shields that feature no designs to impressive shows of regal fleur de lis designs and rampant lion heraldries. 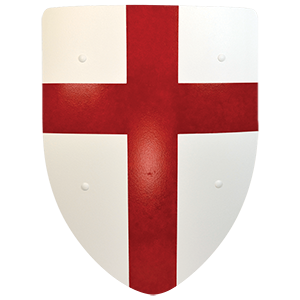 We even offer shields that recreate the classic cross symbols of famous knightly orders, like Templars, Crusaders, and even the Teutonic Knights! If you're planning on setting foot on a reenactment battlefield or an SCA combat event, then you're definitely going to what to have a good shield handy...and if you pick up your battle ready shield at Medieval Armour, you can rest assured that you definitely have a good shield handy and ready. Historically, wood shields were more common their metallic variants, if only because wood shields were easier to replace and easier to create. And here at Medieval Armour, we offer an impressive staggering array of wooden shields, all to offer any intrepid warrior the greatest selection possible, so that he or she can have the functional wooden shield of their dreams. 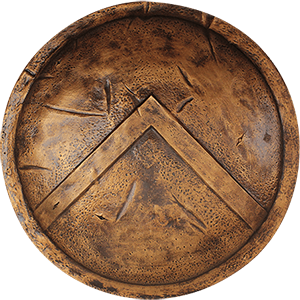 Our selection of wooden medieval shields is truly awe-inspiring, spanning a variety of different styles and eras, so much so that any warrior, from almost any time-frame, could find exactly what they want here. A Norse warrior could find several wooden Viking shields here that will make his fellow berserkers go berserk with envy, while crusaders will find wooden knight shields and crusader shields here that will proudly show off their heraldries and crosses. Even older cultures will find wooden shields that suit their needs, including Greek shields with lambdas and mythic monsters, as well as classic Roman shields like the rectangular scutum. Some of our shields even depict symbols and heraldries of famous figures, like Richard the Lionheart and El Cid, to name a few. And because of their strength and level of construction, they all make for fantastic wooden practice shields, allowing them to shrug off blows like a proper medieval shield should. Designed for use and decorated for display, any of the wooden shields you find here at Medieval Armour would make for a fantastic practice wooden shield to use in training, as well as a great display shield to hang up in your home decor or office for a touch of that impressive medieval or historic style. The crusades were a series of military campaigns launched by Medieval Europeans to retake and hold the holy land, which is to say Jerusalem. Out of this military action came a number of fabled knightly orders, as well as noteworthy designs that, today, are instantly recognizable as symbols of the crusaders, the warriors who fought for their faith. At Medieval Armour, we offer a number of equally iconic crusader shields and knight shields, many of which bare an association with a number of the famed knightly orders that were born during the crusades. And like the shields of the age, we offer both steel shields and wood shields, all of which make for an ideal knights shield. 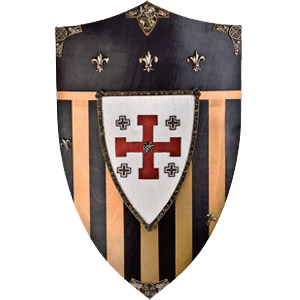 We offer Templar shields, which recreate, in various designs, the classic white and red cross shield that is, even today, associated with the famous Knights Templar. We have Hospitaller shields, which depict the black and white cross shields carried by these knightly priests. We even offer Teutonic shields, in honor of the Teutonic knights who aided pilgrims while fighting during the crusades! Some of our crusade shields are functional shields, being completely battle-ready, in that they're made to withstand and shrug off strikes and blows while keeping their wielder safe and secure. Virtually all of them, though, are impressive display pieces, ensuring that even if you don't wield it in combat, you'll want to carry it around or at least hang it on your wall as a decorative shield. There's no disputing that the crusader shields offered by Medieval Armour are impressive, and they're bound to inspire whether you carry them into battle or hang them on your wall. As fearsome as Vikings warriors and their berserker warriors were, even they understood the importance of carrying a shield. 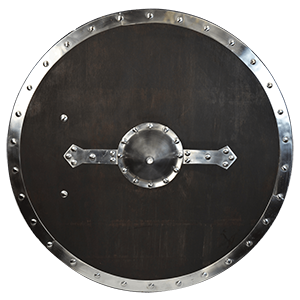 And as popular as Vikings are, Medieval Armour is happy to provide a number of Viking shields that are perfect for completing any warrior's ideal Viking image with either a decorative shield or a fully functional shield. Of course, we don't just offer only Viking shields, but all manner of Norse shields, ranging from Norman shields and Norman kite shields to classic, round Viking shields. In fact, the round Viking shield was traditionally the most common type of Viking shield, as well as a common medieval shield, providing a convenient shape that was easy to use, easy to manufacture, and easy to carry. 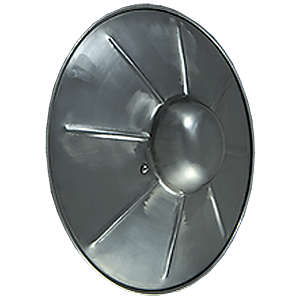 Thus, round Viking shields are among the more common types that we offer, although we do offer a few kite shields in both Viking and Norman designs. And if you're looking for a functional Viking shield, then you've come to the right place, as our wooden Viking shields are every bit as tough and durable metal counterparts, with the added advantage of never rusting! In terms of design, some of our Norse shields are left plain, featuring only wood grain and steel, while others feature impressive designs that feature symbols of the famed Norse berserker, as well as the dragons and chaos symbols that have become associated with Viking culture today. It's up to you if, as a Norse warrior, you want to carry a Viking shield or not, although glory and riches are easier to enjoy when you survive the battle, and a good, functional Viking shield like the ones offered here at Medieval Armour are certainly a good way to improve your odds of survival, as well as your classic Viking image. Shield bosses are designed to be placed at the center of a shield and are meant to deflect the blows from the center of the shield. They were first found in prehistoric ages and were made common in the medieval ages. We offer a variety of shield bosses here that are ideal for adding to your favorite shield to incorporate another aspect of defense in battle or for extra authenticity within costume armour looks. Whether you are part of a reenactment or simply interested in historical fighting styles, these shield bosses are excellent additions to most shields. We offer steel shield bosses and brass Roman shield bosses that you can easily attach to your own favorite shield. When it comes to bringing authentic detail to your shield, as well as more ways to defend yourself with it, be sure to take a look through our shield boss section. Bucklers are traditionally small shields used to deflect the blows of an opponents sword. These shields were typically round but sometimes existed in other shape, and they were used as companion pieces to arming swords, rapiers, and other one-handed weapons. We carry a variety of bucklers here for reenactment, light combat, costume use, or decoration. We offer traditional round steel bucklers and medieval soldier bucklers that can be used in battle as well as impressively decorated wooden buckler shields featuring dragons, lions, fleurs-de-lis, eagles, and more. Our buckler shields come in different sizes for different levels of defense and preference, so you are sure to find a buckler here that will suit your tastes and needs.